Another puzzling interesting photograph received from our regular contributor Stewart Would (UK). Charles Edward Howell was the manager of the York City and County Bank on Beverley Road, Hull. Probably this is him with his wife Frances and step-daughter Christina in 1904 ? -- Difficult one as bonnet familiar but has frontal lower radiator. Advised by our Ariejan Bos that this is a cca 1901 MMC 'Miniature Panhard'. It was equipped with an Iden-modified 1 cyl. De Dion engine. Lovely period photo received from Rev Dr David Steers (UK) asking if we can identify the vehicle on a glass lantern slide. Assuming about 1903. Early Liverpool registration and poss taken on Princes Avenue, Liverpool.-- Registration K 218 is Liverpool CBC whose registrations started Dec 1903 so more likely 1904/5. 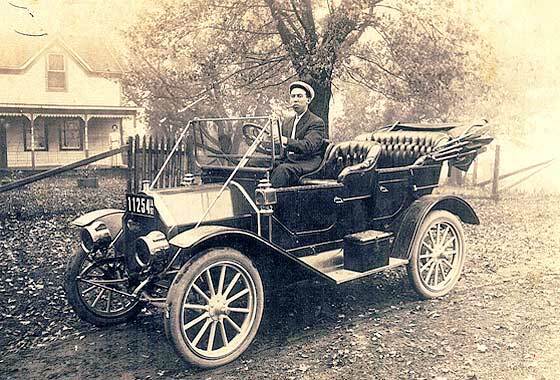 The car is American, made in Lansing Michigan on world's first automotive assembly line which made 19,000 in 1901-7; a cca 1904 Odsmobile Curved Dash 5HP Two-Seater. Our regular contributor Mark Dawber (New Zealand) was intrigued by this photo. 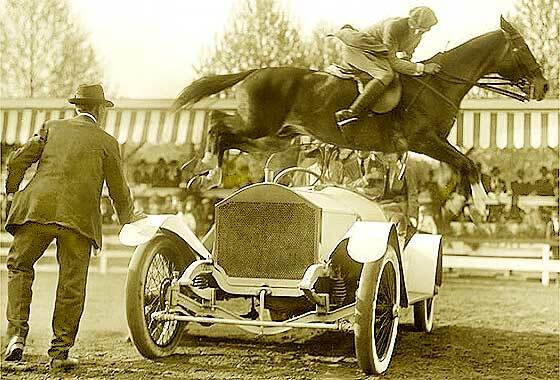 -- Photo has been widely disseminated throughout the web as "Ralph Coffin jumping his horse over Sylvanus Stokes's Rolls Royce, Washington, 1916". May originate from Library of Congress. Attributed to Harris & Ewing, and to Hurst Vitagraph. Horse is called Rabbit - but the car is NOT a Rolls Royce. 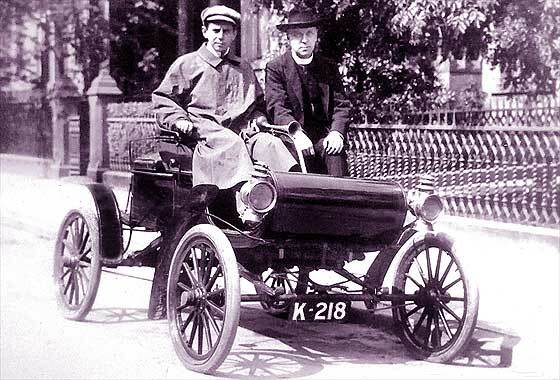 It is British c1907 Napier 60'90 Speedster, but perhaps built in Jamaica Plain, USA. Strange extra front coil shocks. Interesting enquiry received from Harry Hickling (Australia) on the subject of a 1908 Mercedes Simplex 35HP, Chassis No 371, Makers Number/Engine Number 2662, Commission No. 6596' 1125. Believed commissioned in UK after delivery to Milnes Daimler 1909. 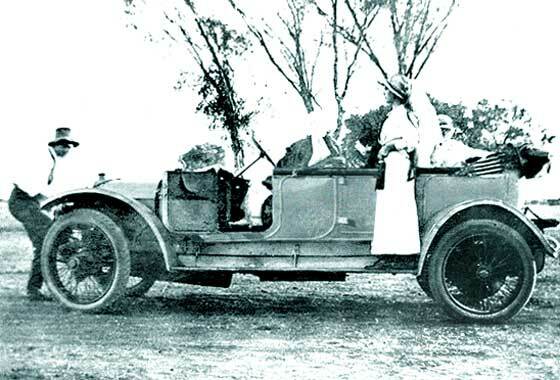 By 1914 car was in Australia, earliest owner either Sir Rupert Clarke or Andrew Spence Chirnside. Barker Body and Rudge Whitworth wheels. Became Station Managers car at Isis Downs Queensland. -- Early history sought! Non informative photo received from 'Craig in Virginia' (USA) with a cryptic comment of " Can you identify this vehicle, not the dude? Thanks for trying," -- So, not much we can learn about the photo and the 'dude' will obviously remain as anonymous as Craig has asked. The car fortunately is far from anomalous because it has a relatively readable badge on the radiator saying 'Cartercar'. High rad cap, shape of wheelhubs and of doors, advise a cca1911 Cartercar Model L Touring. Very interesting period photo received from Jim Kennard of Nelson, (New Zealand) of his grandfather taken in 1913/14. He came to UK 1915, joined the Army, and died 1917. The picture was taken in Argentina where he had a ranch. Mentions sending car engine parts to Argentina to fix a car, which he says is a Daimler or Lanchester. -- Which is not this one ! 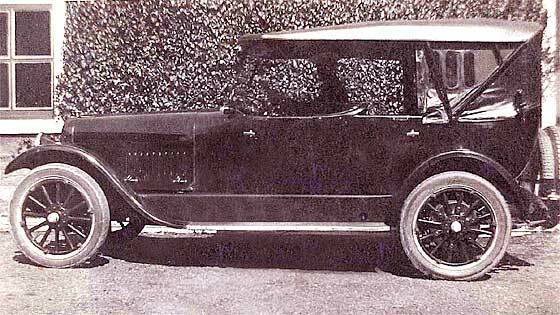 This is also a British car, a more unusual one, being a cca 1913 Straker Squire 15 HP MK2 Two-Seater, made in Bristol. Surfing through the internet in attempting to identify old vehicles we came across a Wikipedia Website Page called Unidentified Automobiles where they are asking for vehicle identification.-- Photo notated 'Levico, Auto Reserve, Car Cleaning' with soldier spraying car with water hose. 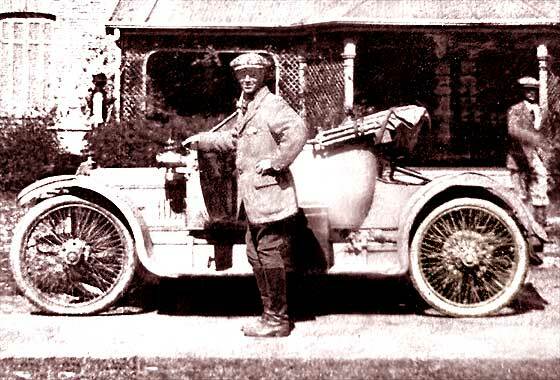 The car right, was made in Chemnitz, Gerany and is a cca 1914 Wanderer 5'12 Tourer. Car behind was made in Prague Czechoslovakia, a cca 1913 Praga Alfa Tourer, - many sold to Austro-Hungarian Army. 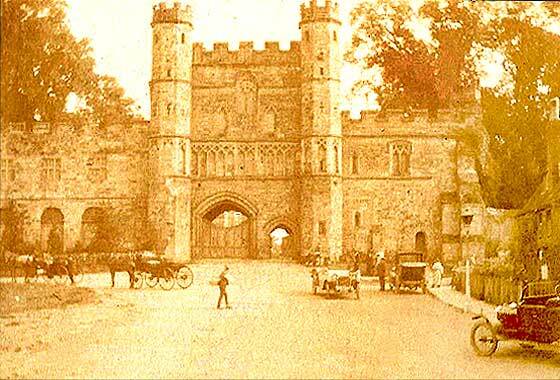 Period photo sent in to Rootschat by Spidermonkey (UK) asking if anybody can help identify the castle and, if good enough eyesight, the cars. -- The building was easy enough being relatively local, and is Battle Abbey, built on site of the Battle of Hastings. Cars are tiny so no luck with the backward landaulette in right back corner. Car on the very right is a right-hand drive pre-1916 Ford Model T . Car on left is more difficult but high headlamps suggest another American, a cca 1914 Hupmobile. Surfing through the internet in attempting to identify old vehicles we came across a New Brunswick Free Public Library Website Page showing a number of interesting unidentified vehicles. -- Photo is notated 'Car Wreck N 68, NJ 1915 and looked interesting because of unusual front suspension arrangement, a pair of shock absorbers affixed between the front axle and headlight stanchions. Could well be same car, wrecked, as on our previous page, a New York built cca 1915 Crane Simplex M5. 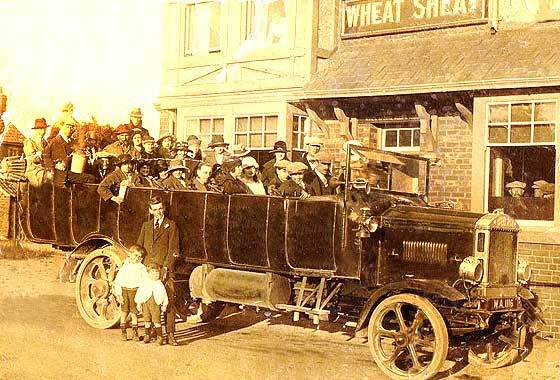 Period photo sent in to Rootschat by Treetotal (UK) on the subject of identifying old Charabancs and asking if anybody can identify the vehicles depicted on a photo notated 'Charabanc 1919'. -- Fortunately both vehicles show the radiators which is unusual for charabanc photos; most show only the rear part with people in. Our Ariejan Bos helped with both advising that the charabanc on the left with a circular radiator was pre-WW1 French cca1915 Porthos Tourer converted to Charabanc. 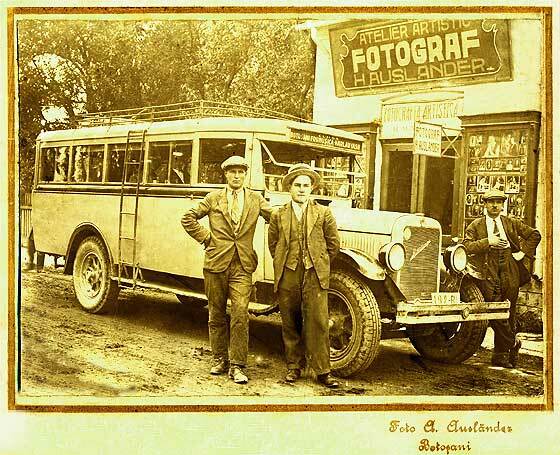 Period photo sent in to Rootschat by Treetotal (UK) on the subject of identifying old Charabancs and asking if anybody can identify the vehicles depicted on a photo notated 'Charabanc 1919'. -- Fortunately both vehicles show the radiators and this one full registration. MX 8074 was Middlesex c1916. 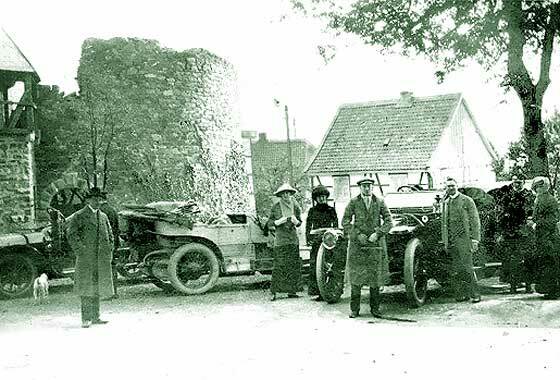 Our Ariejan Bos helped with both advising that the charabanc on the right is a also a French vehicle, made in Lyon, so a cca 1916 Rochet Schneider. Became Theophile Schneider, later Berliet. Period photo sent in to Rootschat on the subject of identifying old Charabancs and asking if anybody can identify the vehicle depicted on a photo notated 'The Shooters at The Wheatsheaf 1920'. -- Fortunately this vehicle shows the registration so dating can be relatively accurate. WA 1115 was a Leeds County Borough Council registration between 1919- 1924, so probably cca 1920. 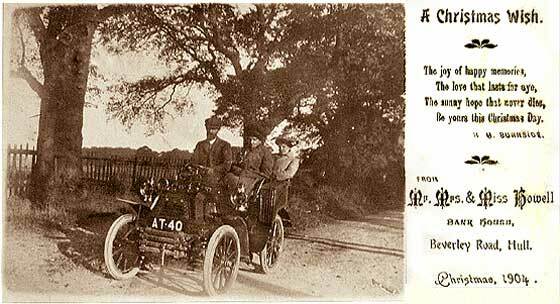 The writing on radiator is just about readable confirming it is therefore a cca 1920 Maudslay Charabanc. 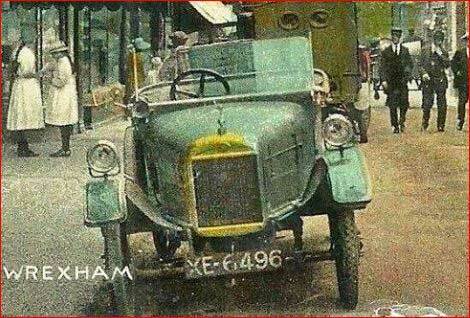 Period photo sent in to Rootschat by Wilcocon (UK) asking if anybody can help identify the the car make from a cropped hand coloured postcard of Wrexham dated 1922. Suggestions of Benjamin or Lagonda. -- Registration XE 6496 was London County Council late 1920. It is not a Benjamin nor a Langonda but a car made by the Grice, Wood & Keiller Company in Maidenhead in Berkshire. This is the later cca 1920 GWK Type F/H with shaft dive to friction disc. 1,700 cars made 1919 to 1926. 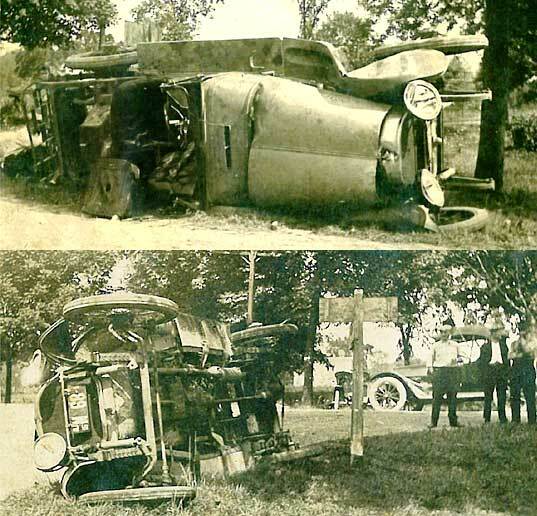 A number of interesting photographs received from Amy Tillson (UK) saying all vehicles belonged to Mr Wigan of Brandon Park in Suffolk in the 1930s. 'Breaking New Ground', as lottery funded organisation are restoring the Engine House/Garage where the vehicles were kept. -- No registration to help in dating but many features point to it being American. Made by company started in 1852 in Indiana making horse wagons. This car is a cca 1921 Studebaker Special Six Model EH Touring. 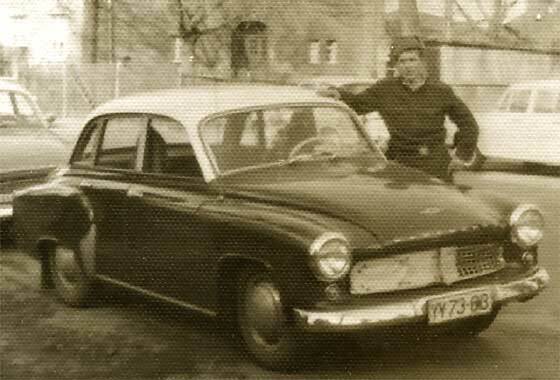 Interesting enquiry received from Lindsay Sawyer (Scotland) asking if we can identify the car in the photo? It must be dated about 1930; the old gent in the dickey seat was my great uncle who died in 1938. Many thanks. -- Registration KL 1099 is Kent County Council issue of late 1924. From the curved dickey seat this would be a cca 1923 Standard 14HP SLO Two-Seater and Double Dickey. Four Cylinder 1307cc engine, 55mph, 35mpg, no front brakes; cost £235. 10,000 cars made in 1924. 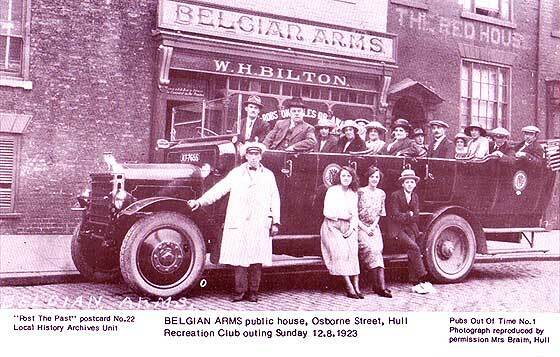 Period photo sent in to Rootschat by Treetotal (UK) on the subject of identifying old Charabancs and asking if anybody can identify the vehicles depicted on a photo notated 'Belgian Arms Hull, 1923'. -- This vehicle shows the registration AT 7656 which is Kingston-upon-Hull CBC 1904-1925, but dating records are not available. Fortunately photo shows the radiator and the outline of the maker's name is visible. 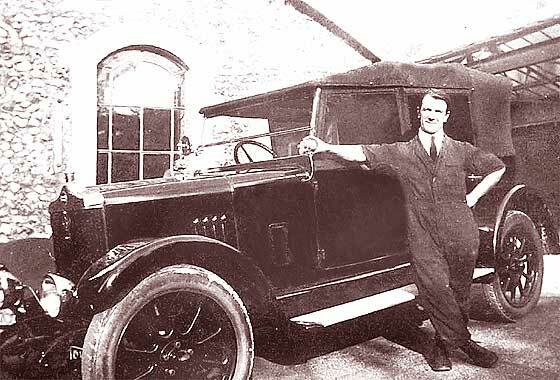 From having modern wheels/tyres, a cca 1923 Daimler Charabanc, poss CK2. A number of interesting photographs received from Amy Tillson (UK) saying they would be very grateful if we are able to help them identify any of the vehicles in these photos! They're from c1930. -- Regretfully the front of the car is not fully visible so cannot see Registration which would give us accurate dating. 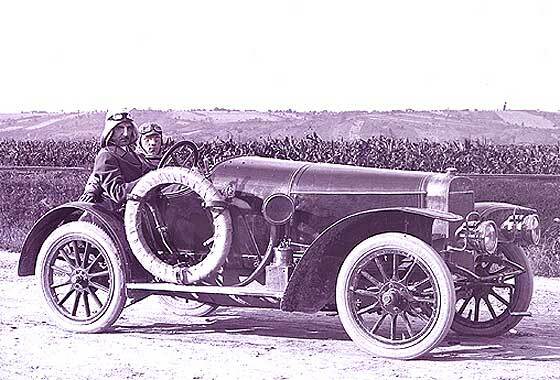 The radiator core is wrap-round, bonnet has four louvers, there would seem to be no front brakes, and has low slung headlamps, which points to cca 1924 Standard 11'14 Open Tourer . Another fascinating photograph from our regular contributor Cicos Florin in Constanta by the Black Sea (Romania) who is interested in old cars of Romania. Do we know what the car is? -- Excitingly rare car recognised by Frazer Sloan as Italian Aurea, made in Turin, by Fabbrica Anonima Torinese Automobili. As 'FATA' in name, suggests cca 1925'26 FATA Aurea Series 600. Factory close to FIAT and made under Ceirano ownership. Exported only to UK and Austria, - and via UK to Australia. 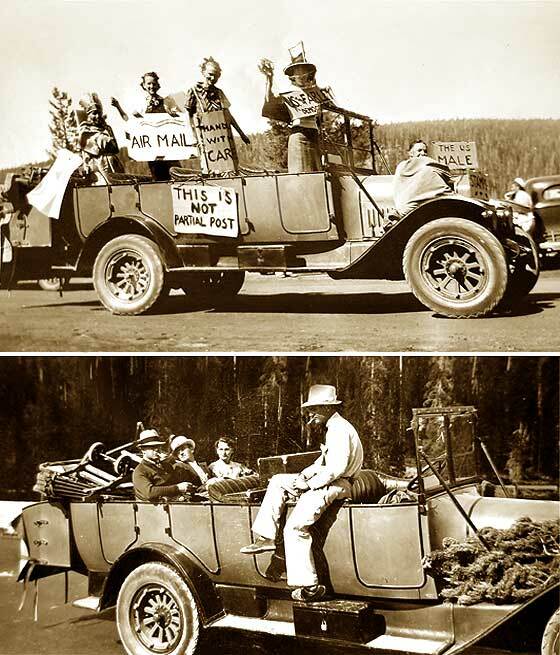 A couple of photo-of-photos received from Michal Owens (USA) saying he would love to identify vehicle his grandmother is in, in what looks like a parade. Poss taken c1936/7 in northern Arizona near Mogollon Rim where grandmother had summer home.-- These two photos were a bit distorted so corrected. 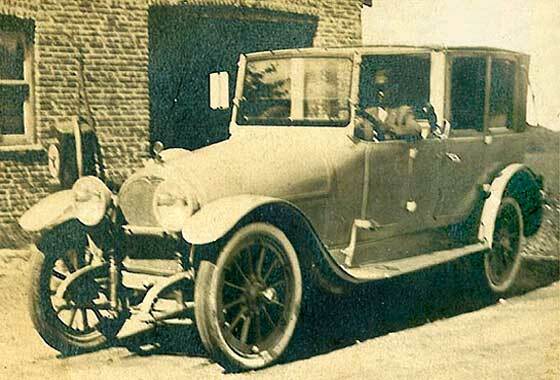 Vehicle is a cca 1925 White Model 15'45 Bus with Bender Body, one of 90 purchased 1920 by the Yellowstone Park Transp. Co. Fire destroyed all fleet so new batch of 90 purchased 1925. A number of interesting photographs received from Amy Tillson (UK) saying they would be very grateful if we are able to help them identify any of the vehicles in these photos! They're from c1930. -- These two photos were submitted as two vehicles but are the same combination. 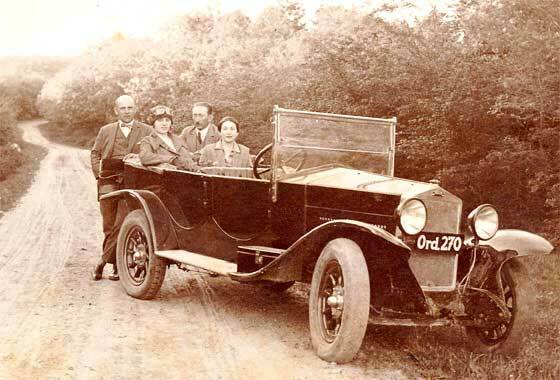 Registration on one photo is visible as CF 8122 which is West Suffolk County Council 1928. On the other photo is just possible to see BSA on the tank. 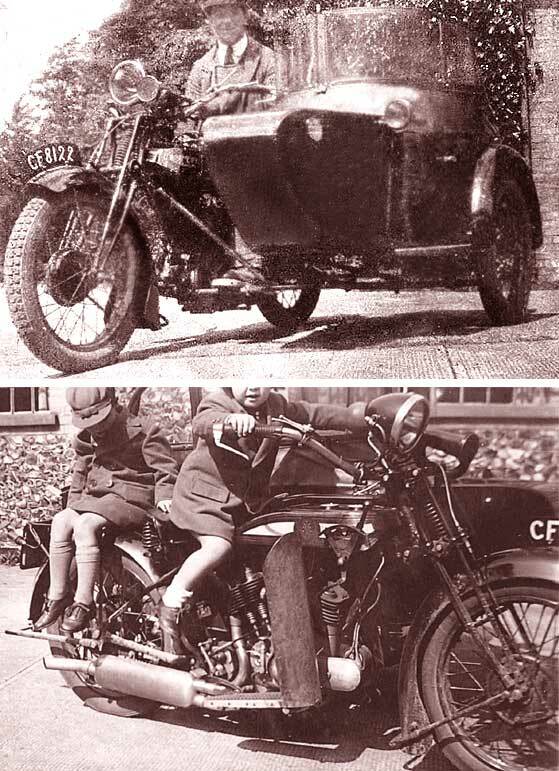 So, this is a cca 1928 BSA 770cc V Twin Motorcycle & Sidecar. Another fascinating photograph from our regular contributor Cicos Florin in Constanta by the Black Sea (Romania) who is interested in old cars of Romania. Do we know what the vehicle is? -- Made in Lansing, Michigan, USA, by Ransom E Olds who started Olds in 1897, but left in 1905 to form REO Car Co. Added truck manufacturing which eventually took over in 1936. This is a cca 1929 REO Speedwagon Bus. Speedwagon name introduced in 1915 until 1953. Became Diamond - REO to 1975. Another photo received from our regular contributor Raoul Rainer from Stuttgart (Germany) from a batch of photos he purchased recently and has on a big website on line. Looks like a British car from the 1930s, vaguely reminiscent of an Alvis, but much smaller. The radiator mascot looks like a pointed 'A'. -- Unusual car but one is on our Help Page 75. 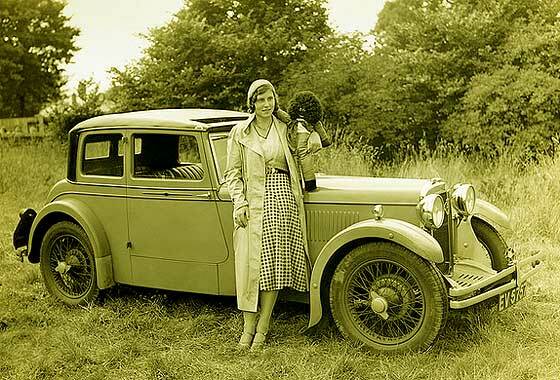 This is a Kent County Council registered late 1931 Standard Avon 16 HP Close-Coupled Coupe, Weyman Panelled, advertised priced £325, 1932. One of a number of interesting photos sent to us by Andrew Kostin from Moscow (Russia) who is a collector of old photos. Can we identify snapshot taken on 1967 showing Soviet Army soldier posing by a car somewhere in the Eastern Europe. -- This is a vehicle manufactured in Eisenach in Eastern Germany founded in 1896 as FFE making a licensed Decauville. In 1903 it became Dixi who were taken over in 1928 by BMW; EMW in 1952. This is a cca 1960 Wartburg 311 Limousine (56-65). Another fascinating photograph from our regular contributor Cicos Florin in Constanta by the Black Sea (Romania) who is interested in old cars of Romania. Do we know what the car is? -- None of our experts could nail it because it may be a 'special'. Overtones of a Hispano? Found some Romanian text saying the chaps were a transport company who also did some racing in a possibly an Opel or a Studebaker or a French racer. Not Opel, not American, not yet found anything French? 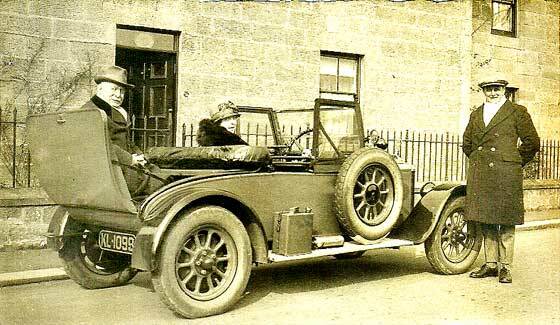 Anoher photo received from Turtle Bunbury (Eire) who is trying to identify the make of the vehicle on the right.. The collection of three cars is captioned " T Schloss Burg, Germany, 1913" . The Drew family went on a road trip to Germany that year. -- Another we regretfully cannot identify because people are blocking out all ID features and photo is simply too small and dark to enlarge detail of the cars at back. Bodywork does not help as it would have been made by coachbuilder.